These Plastic German Style Beer Mugs are perfect for bars, restaurants, clubs, fraternities, sororities, promotions, and much more. You can imprint the mugs with the one to three color spot imprint of your choice (call 1-800-233-0828 to inquire about full color imprints!). 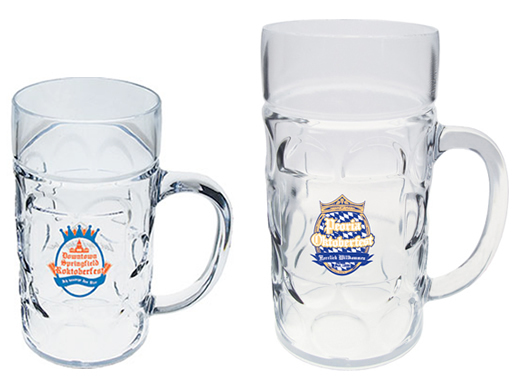 These Custom Plastic German Beer Mugs are perfect for German theme celebrations, Oktoberfest events, and much more. You can choose from two sizes of Plastic German Beer Mugs: Half Liter (16.5 oz.) Plastic German Beer Mugs and One Liter (33 oz.) Plastic German Beer Mugs. Our handy, 0.5 Liter Plastic Mugs offer a unique way to serve up a pint of German Beer or any brew you choose. Our large, 1 Liter Plastic Mugs are a great option when you are looking to serve an extra generous portion of celebratory brew. Both our Plastic German Beer Mugs are made in the USA of durable acrylic to ensure long use. Your satisfaction is guaranteed when you order custom glassware from us. G005 .5 Liter 16.5oz German Beer Mug 3.15 2.95 2.79 2.67 2.55 2.45 2" 2"
G1 1 Liter 33oz German Beer Mug 3.95 3.89 3.74 3.63 3.53 3.49 1.5" 1.75"
It's easy to get started with your Custom German Mugs – simply call 1-800-233-0828. Then e-mail your camera-ready artwork to graphics@kardwell.com The minimum order is just 50 German Mugs and production time is about three weeks. Rush production/delivery is available for an additional charge.